Business Structure | About Us | Oji Tac Co.,Ltd. Our business revolves around three main areas. 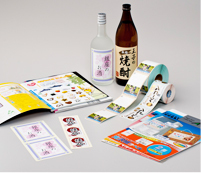 The first is self-adhesive products, base materials for labels before printing and processing. 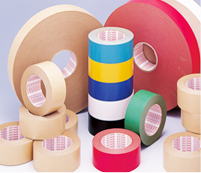 The second is adhesive tape products, used daily for wrapping, sealing, fastening and other purposes. And the third is processed products, such as polyethelene laminated paper, release liner for industrial processes, etc. Around the core of these three main areas, we operate in a variety of fields where adhesive products are used, from food products to industry, electricity and healthcare. Self-adhesive products (paper and film base) is the base material used for printing and processing the labels that surround us in our daily lives. We use superior materials from inside and outside the Oji Group and apply the latest technology to develop, manufacture and sell various self-adhesive products. The labels made from these self-adhesive products are used for a wide range of purposes, from price labels on fish and meat containers in supermarkets, and labels on detergent bottles and other objects close to daily life, to barcode labels for quality control in factories. We are also expanding their use into a range of other fields; for example, they are well suited to special industrial uses, due to powerful adhesion after peeling off the release paper. We offer a broad lineup based around a core of adhesive tape products for daily use in wrapping, sealing, fastening and other purposes, but also including industrial adhesive tape. As high-performance products, our kraft tape for corrugated cardboard combines slip-resistance properties (to prevent load shifting) with writability (for writing directly with oil-based pens). We also produce kraft tape that can be recycled even when stuck on corrugated cardboard, and film tape that is easy to tear straight by hand, among others. Beside these, we also sell tape made from washi Japanese paper, and cellophane tape with printed logos. For industrial use, we offer a full range including aluminum tape with superior heat and sound insulation effects (used in air-conditioning equipment), double-sided tape and masking tape. We use “processed products” as other products except self - adhesive and adhesive tape products. This is the third of our three main business areas, and includes a wide range of high-performance products based on processing technology. For example, some of these products are for industrial use, including polyethylene laminated paper with excellent moisture resistance and waterproof properties, and release paper for industrial processes, indispensable for the manufacture of synthetic leather. Closer to daily life, our products include PE laminated nonwoven fabrics for simple pocket warmers, providing moderate breathability, and adhesive film for simple pocket warmers offering excellent adhesion to clothing. The Oji Group started its papermaking business as the first fully-fledged modern industry in Japan. Inheriting the philosophy espoused by our founder Eiichi Shibusawa in his Rongo to Soroban (“Analects and Abacus”) – namely, the philosophy of union between virtue and economy, and the coexistence of ethics and profit – we recognize our mission as being threefold: to provide a stable supply of products that are indispensable to society and daily life; to reform our corporate management and develop technology; and to build a more prosperous future through our business. We are continuing to grow with a view to maximizing our corporate worth. 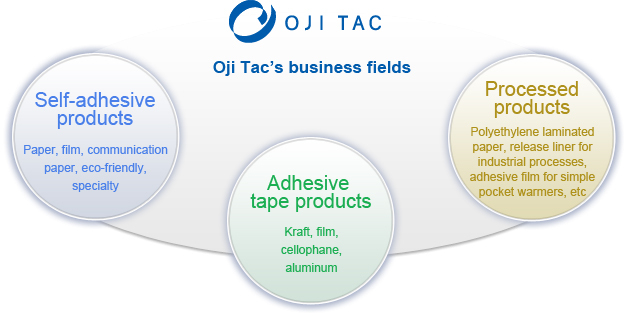 As a member of the Oji Group Functional Materials Company, Oji Tac is continuously engaged in vigorous corporate activity aimed at delivering a more prosperous future for all.